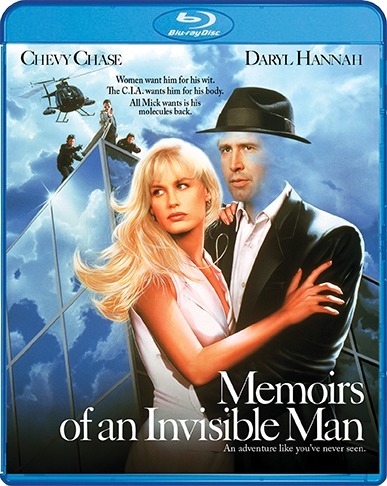 The film follows a guy named Nick (Chevy Chase), who is a stock analyst who in a superhero-like turn of events, is transformed into the invisible man. The CIA finds out about him and wants to recruit him as a super spy, but he wants no part in it and is on the run from just about everyone in hopes to find a doctor who can reverse his issue. It’s a solid movie and is an anomaly on both Chase and Carpenter’s film resume. This is kind of a family-friendly sci-fi comedy for Carpenter, where this is perhaps the most serious role Chevy Chase took on and he nails it. It still holds up to this day and should be seen. In fact, this film was super rare and out-of-print for the longest time until now. All the more reason to get this one from Scream Factory. The new video and audio presentations are good and there are some vintage bonus features as well, but no new ones. Still, this comes recommended. This entry was posted on Wednesday, October 3rd, 2018 at 6:50 pm	and is filed under Film, News, Podcast. You can follow any responses to this entry through the RSS 2.0 feed. You can skip to the end and leave a response. Pinging is currently not allowed. You never told me about your cat milking days in Motown.